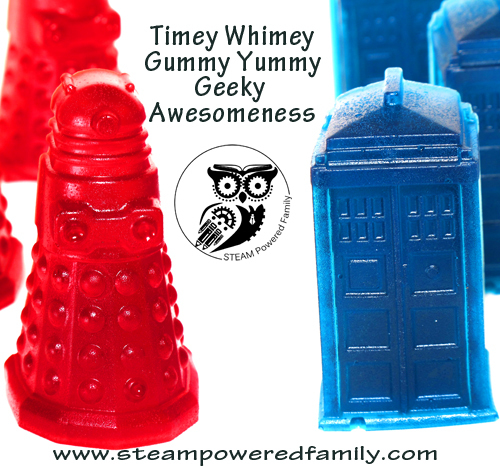 Glorious, geeky, timey, whimey, gummy, yummy awesomeness… also known as handmade Doctor Who gummy candies! When we first set out to make these I admit, I had some doubts, but these little treats are amazing and not hard to make at all. We have made so many different gummy candies, not just Doctor Who Gummy Candies, but also Star Wars, Lego, dinosaurs, flowers and so much more! I will give you a moment to let the awesomeness of that thought sink in. Pretty awesome right? Well this is how it happened. You know when you are browsing the web and you see an idea, and then like a domino effect your brain races ahead linking together possibilities. You’re excited and nervous – those Pinterest fails still haunt you – but you race ahead, hopeful that your dreams can become reality. That THIS time it might work. And it exceeds all your expectations. When I pulled these from their molds I giggled and happy danced around the kitchen like a loonie! To say I’m a huge Doctor Who fan would be a massive understatement. 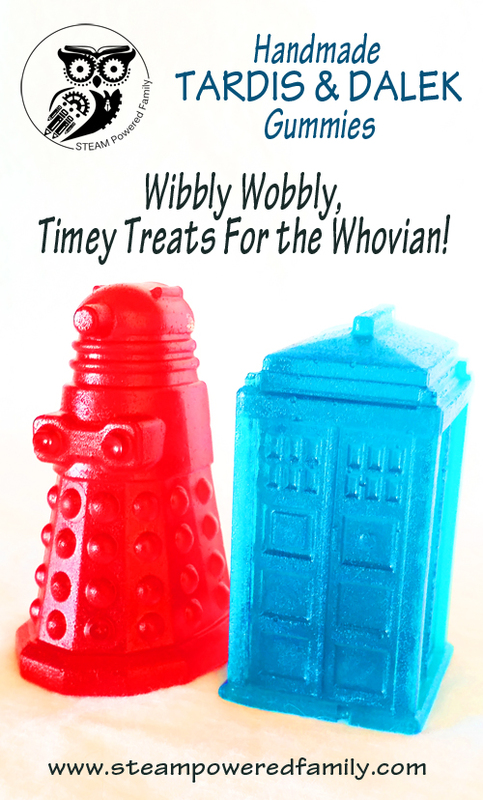 So when I discovered I could make my own TARDIS and Dalek candies I just about burst. I woke up my kids, wafting sugary goodness under their noses. I gazed upon the candy’s gem-like clarity and beauty. I let my boys test the wiggly, wobbly-ness of the gummies, but they weren’t allowed to taste them. Not yet! They could only gaze in wonder and amazement at the creations. I needed time to savour the moment. 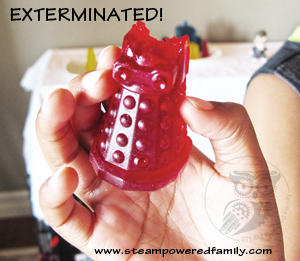 Then it was time to… EXTERMINATE! 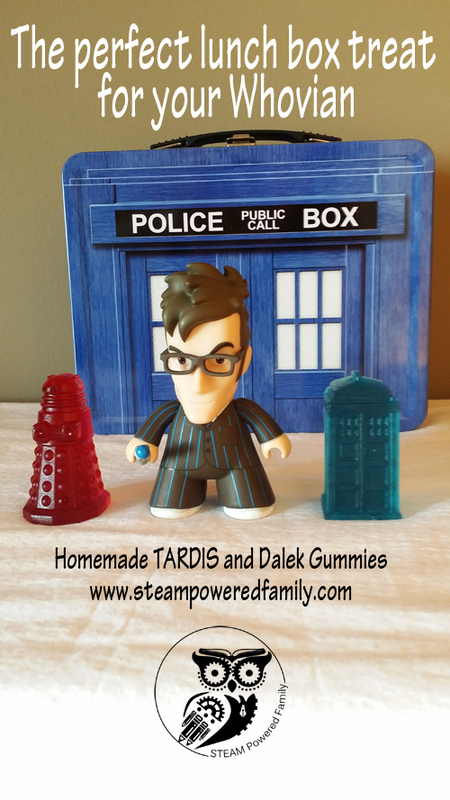 So, would you like to make your own Doctor Who gummy candies? It’s actually really easy. I’ve included affiliate links for your convenience. First you need to get the molds. ThinkGeek is my go to place for Doctor Who stuff. I have both the ice cube tray and the cake molds (we will get to that one in a moment). For now all you need is the ice cube tray. Add 1/4 cup corn syrup and mix until the liquid goes clear. Pour the mixture into a pot but don’t turn on the heat yet! Add two packets of unflavoured gelatin. Add 1 package of flavoured jello. Mix slowly and carefully. It will take a few minutes for it all to dissolve. Once dissolved, turn on low to medium heat for about 10 minutes until it just starts to bubble. Stir regularly and gently so it doesn’t burn. Remove from the heat and pour into a disposable coffee cup. Let sit overnight (about 8 to 12 hours). Peel off the cup to free the solidified gummy. Carefully cut off the white top leaving just the chunk of gummy goodness. Place the gummy goodness in a pot and heat over low/medium heat until liquified. Stir regularly to prevent burning. 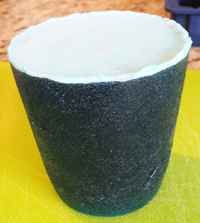 Transfer into something easy to pour with, I used a funnel to fill an old condiment container with a squeezie top. Let sit 6 to 8 hours at room temperature. I left them overnight. Remove from the molds slowly and carefully. Gaze on the awesomeness of your creation! They can be quite sticky but I found putting them in an airtight container and refrigerating helped decrease the stickiness. Can you imagine finding these in your lunch box? Building on the success of my first batch I made a second batch in new colours! Then I decided it was time to really go epic, I pulled out my TARDIS cake mold from ThinkGeek and went all the way, tripling the batch so I would have enough. 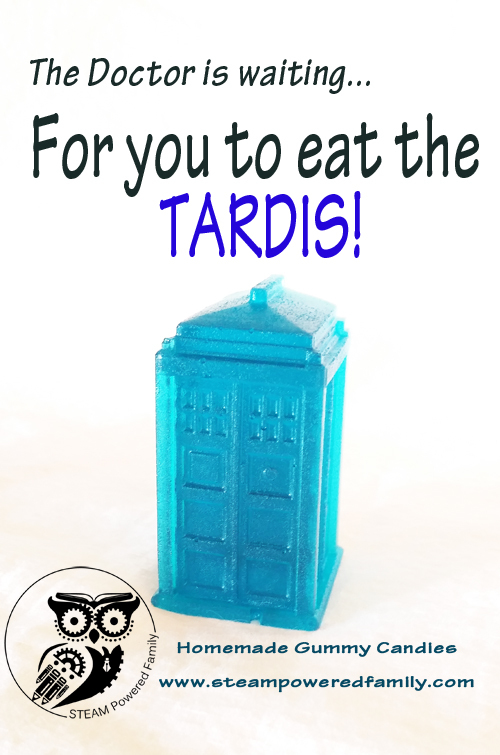 When it was finished I had 1 Pound TARDIS Gummy! Yes, we actually weighed it to confirm. 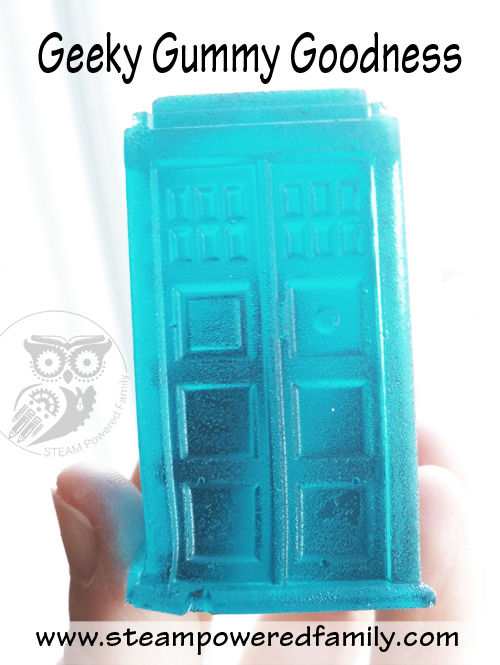 And yes I let my kids eat it, because it’s a 1 Pound TARDIS Gummy! I have to say of all my experiments this TOPS them all. I read a number of resources about making gummies but the best one, and the one that really started those dominoes toppling over, was this video about making Lego gummies. It’s well worth watching just for all his tips and to see the process he uses. 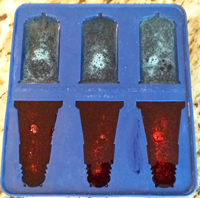 This experiment making Doctor Who gummy candies earned me some serious Mom bonus points with the kids. I made candy! And it was geeky, awesome candy! Oh, and they tasted as awesome as they look. Love my 10th Doctor Figure? It is a Nerd Block exclusive! Sign up to get your box of goodies delivered every month. We LOVE it when our box arrives! This looks great. I might have to pick up these molds too, my oldest is going to love this. He’s a Dr Who fanatic just like his mom 😉 The youngest isn’t, but who doesn’t like candy, no matter what it looks like, right? Time to get creative this summer. Thanks for the tip! The molds are on sale right now at ThinkGeek. 🙂 And don’t worry about your youngest, he will understand the power of the Doctor soon. I am not sure it’s possible that I could LOVE this more! LOVE it! Pinned! Wow! You had me giggling with how awesome these are. 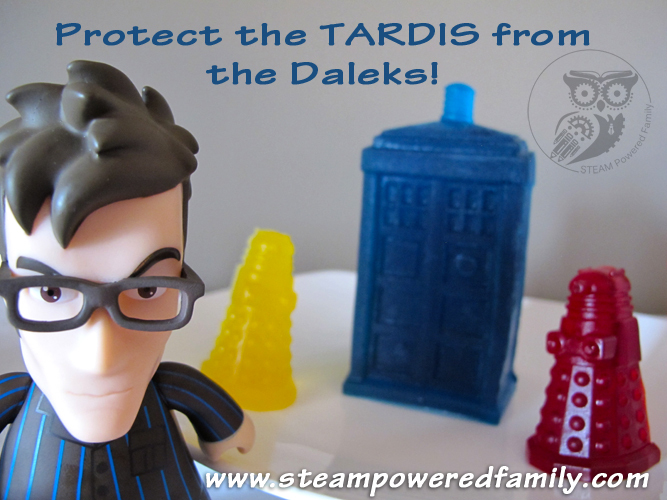 I want a set so I can make chocolate daleks and tardis’s. This is such a cute idea! I know some Doctor Who lovers who would love this! Thanks for joining the Link-It To Me link party! I hope you will party with us again this week! These are AWESOME! I need to get this mold and whip up some next time I make my Tardis cake. Love! I think it’s on sale right now at ThinkGeek! I have a lot of friends who would LOVE this idea! Thanks for linking up to the Blogger Brags link party. I’ve pinned your post to the Blogger Brags Pinterest board. I’m so glad! I made Lego bricks and minifigs as well. So much fun with this one recipe! So cool! 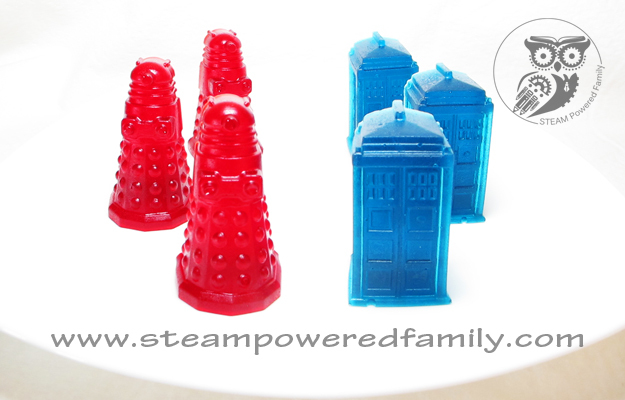 There’s a Dr Who shop round the corner from our house, might have to see if they sell these moulds! You have an entire shop dedicated to Dr. Who? Where is this wonderous place and how quickly can I move into the neighbourhood??????? 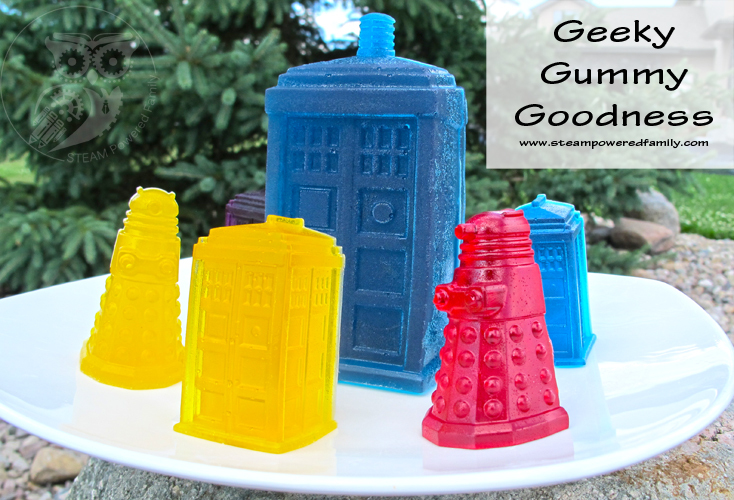 I’m not really a Dr. Who fan, but suddenly I’m in the mood for gummies…lol Thanks for linking up at Tips & Tricks Tuesday!